PHOTO BY PAT GAIETTO Calvert's Nick Seifert shoots as New Riegel's Darek Feindel defends Friday. NEW RIEGEL — Things weren’t looking good for Calvert Friday night. In a rivalry game at New Riegel — a tough place to play on any night — Calvert trailed 30-17 at the half after a lackluster 17-3 second quarter in favor of the Blue Jackets. Beginning in the second half, the Senecas chipped away. They got to within 37-30 after three periods. Late in the fourth quarter, freshman Garrett Spaun–who has been battling an ankle injury — saw his first extended minutes in a few weeks. He didn’t shy away from the moment. Spaun drained three consecutive 3-pointers to give the Senecas their first lead since 11-10 early in the opening quarter. Even after the game went into overtime, the freshman, along with sophomore Nick Seifert, carried the Senecas to a gritty 64-57 Sandusky Bay Conference River Division win. “We talk almost every day about keeping high energy, effort and intensity up and those were our goals coming into today,” Calvert coach Jon Otterbacher said. “I don’t think we did a very good job of that in the second quarter, obviously, of capitalizing on where the openings were against their zone and they caught us on our heels quite a bit. The one constant was Seifert. The 6-foot-3 guard drove the lane and finished with a lot of physical contact down low. New Riegel (7-10, 5-6) got off to a good start with an 8-2 advantage after consecutive triples from Cole Noftz and Chris Acree. Calvert battled back and took a 14-13 lead at the end of the first after a Spaun trey to end the quarter. Then New Riegel had one of its best quarters of the season, jumping out to a 22-14 advantage with a 9-0 run. Calvert’s Hunter Hendrix drained a 3 to stop the bleeding, but Bryce Hohman and Noftz swished treys to balloon the lead 28-17. “We’ve had a few of these lately,” New Riegel coach Dave Losey said concerning close losses. “The Spaun kid played great down the stretch. He hit three 3s in the fourth, which you can’t understate how big those were. He had to make free throws down the stretch and he didn’t miss any of those either, so as a freshman, that’s quite the composure. In the second half, New Riegel didn’t find as many open looks as Calvert ramped up the defensive pressure. “They pressured us and it sped us up, so we couldn’t do what we wanted to do on the offensive end,” Losey said. They just drove it right down our throats. They made some shots and we didn’t make enough stops. It’s that simple. 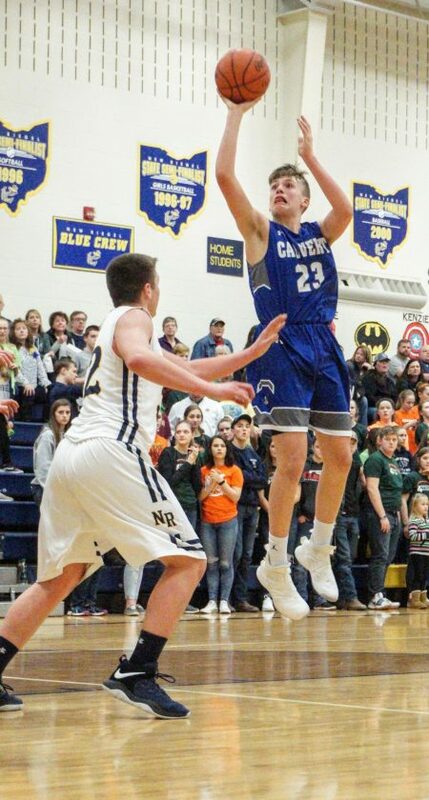 When Calvert needed a boost late, Seifert delivered as he had 18 of his 24 points in the fourth quarter and overtime. Reinhart had an excellent game for the Blue Jackets with 19 points, 10 rebounds, three assists and a pair of steals, while Darek Feindel added 15 points and 11 boards. Hohman and Noftz both had eight points. Seifert also pulled down nine rebounds for the Senecas, who improved to 13-5 overall and 10-1 in the SBC River. With Old Fort also winning Friday, both teams are tied atop the division at 10-1. However, this week will be telling for the division as Calvert travels to Sandusky St. Mary Wednesday and then travels to Old Fort Friday.